Follow influencers, engage with your audience, run analytics, schedule posts at the right time and day, re-post well performing posts, track what goes viral…. Can you honestly do all of that manually? Research shows that we waste about 6 hours per week on social media activities for businesses. Why waste? Because it could be all automated and you could spend this time on activities that grow the business rather than your to-do list. How can you do that? With social media management tools. You only have 24 hours in a day (unless you’ve discovered something we haven’t, and then, please do share!). And those are never enough for all social media activities you need to be doing. 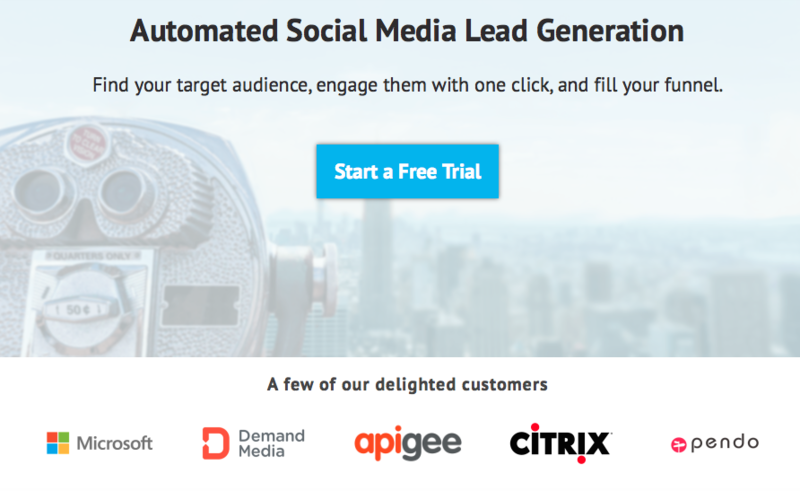 But after you decide to automate your social media efforts, another issue come up – there are 211 different marketing automation solutions on the market today. What should you go for? We did the work for you and found the best social media tools for 2016 (for now). If you’re wondering which one is the best, read till the end and you’ll find our best tip for choosing the right tools for your social media. 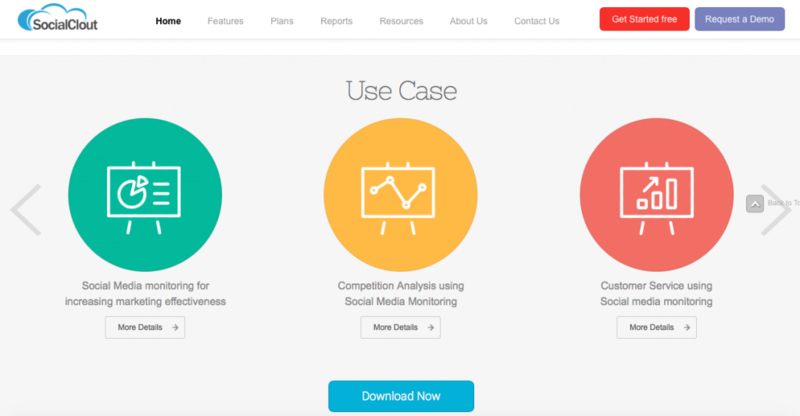 Want an enterprise-quality social media management tool for free or as low as $9.99/month? Go for HootSuite. 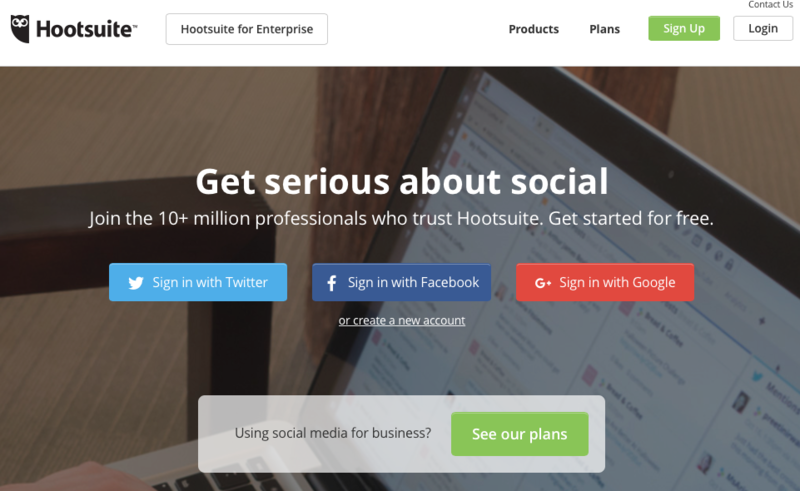 As the tagline goes, Hootsuite is for those who want to get serious about social. It has near unlimited capabilities with more than 35 social media network integrations. HootSuite is all-in-one social media management tool – you not only schedule campaigns and follow conversations, but get detailed analytics, all in one place. HootSuite is for businesses that plan to expand and grow – it offers capabilities that fit your needs whatever your size. 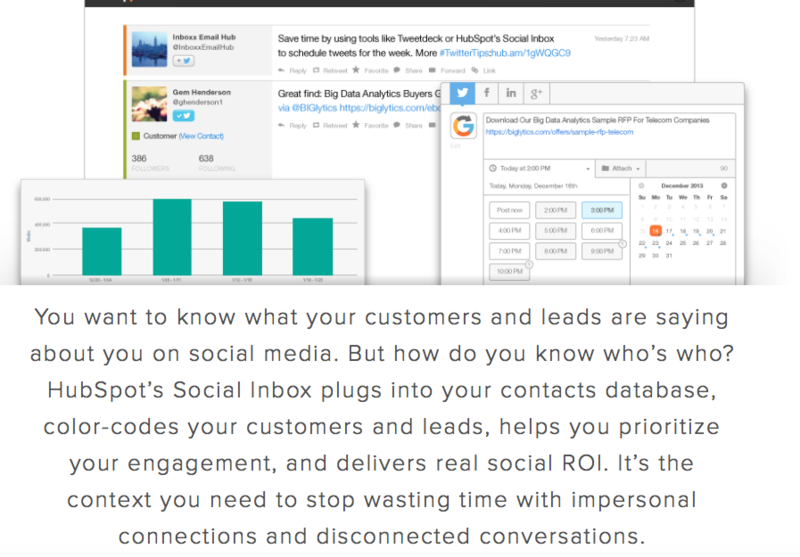 With its unlimited capabilities HootSuite isn’t keeping it simple. There is much to learn and to master. If you’re looking to start posting and scheduling in less than 5 minutes keep reading. 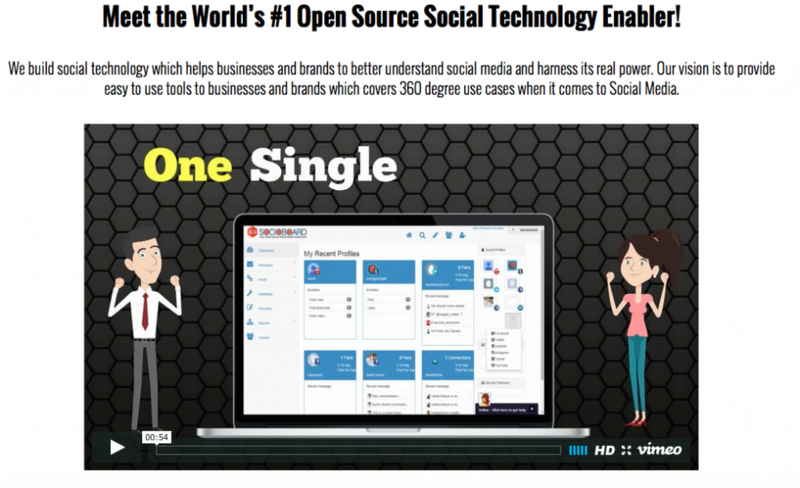 Socioboard is one of a kind open-source desktop application for social media marketers. Which means that it might not be perfect yet, but it’s free. It supports a wide variety of social media networks, creates reports and customizes your social media presence. Socioboard is different because it can be used both as a web app and a mobile app compatible with Android and iOS. That’s great if you’re working on the go and need to schedule and manage social media posts while away from your desk. It would be a lie, if I said I didn’t have a favorite social media management tool. IFTTT is definitely in my top 3. Why? Because it’s free (the basic version, but that’s all a small business needs) and it automates marketing in a way that lets you forget about it. IFTTT (If This Then That) can actually automate most of your life, if you set it up right. One app that posts every new blog posts to social media and republishing sites? One app that turns on the heater at home just in time before I get home from work? IFTTT is one app that has it all. It gets really fun when you learn to leverage the power of Buffer and Hootsuite combined with IFTTT – it works magic! Imagine saving hours of sharing, re-posting and scheduling on social media and having time for …well, whatever you want! The power of IFTTT…Now you know my secret – I’m an IFTTT addict. 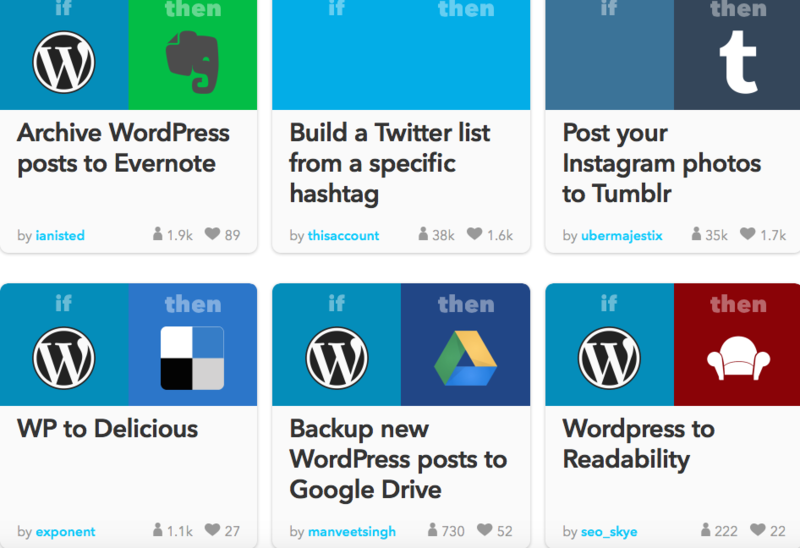 In short, if you’re not using IFTTT, then you’re wasting your time. No wonder Buffer is the new favorite tool of social media marketers. It’s not new itself, but lately the Buffer team has been focused on making it super easy for everyone to use social media management tools – from the blogger to the enterprise. We love it because the interface is user-friendly, simple to navigate but with powerful analytics, all in one place. Now, let’s see why Buffer rocks. Recently, Buffer created Pablo. Pablo is a tool for easily creating simple, free images for your social media posts. Each graphic you create can be scheduled in Buffer, or shared directly with a few clicks. Integrating Pablo and Buffer gives you insights on the best performing graphics in your social media accounts and the extension does one thing you’ll love! The Pablo extension for Chrome allows you to grab text or other design elements off of web pages directly. With Buffer and Pablo, you have no excuse for social media posts without outstanding images. Another awesome feature is that Buffer chooses the best posting times for each social media so you don’t need to think about it. Sure, you can adjust time of the day and posts per day but why bother when the guys from Buffer do it all for you? Are you into recycling? Then you’ll love Edgar! Edgar does something that most people don’t think about – re-use old content on social media as long as it’s relevant. Edgar let’s you analyze what works best and repost for maximum reach.With Edgar you can locate incredible content that many followers may have missed. 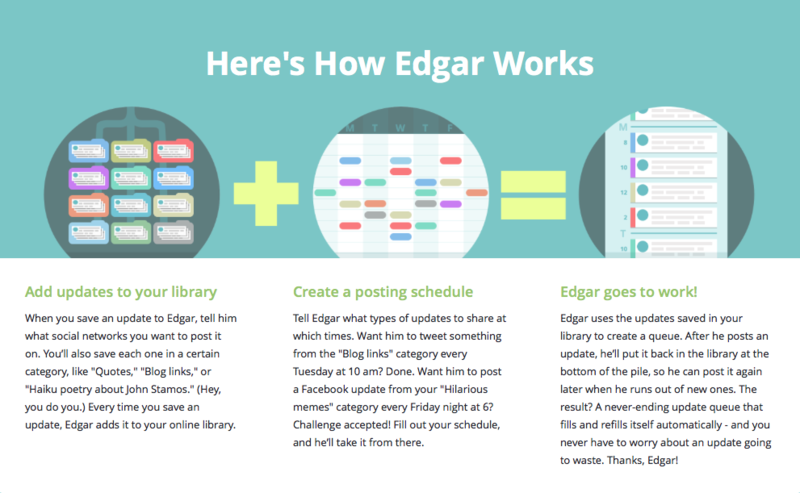 Edgar categorizes your posts to be re-posted in the near future automatically. Yes, that’s the keyword. Edgar does all the analyzing and rescheduling for you $49/month. It’s worth it – Edgar thinks when you don’t feel like doing it. A social media management tool that does one very important job – it replaces keywords in your posts with hashtags! This makes it perfect for Twitter, Instagram and even Facebook, but not so much for LinkedIn for example, where hashtags are a big no-no. Bundlepost is free to try and costs $19 to $100/month depending on how big you want to go. It goes without saying that the HubSpot team has come up with something that makes a difference in your social media management. HubSpot’s social media tool allows you to focus on the conversations that really matter – turning social media from a thing that is nice to do into something that brings in measurable revenue. For example, the tool color codes your tweets and creates deeper profiles for your followers so you can stop randomly messaging and start actively engaging. However, HubSpot isn’t a good fit for the budget of every small business so keep it under your radar if you’re planning to grow and can afford to invest in your marketing. Social Clout is an analytics tool with a twist. The free account allows for 5 social media profiles and will get you 2 reports which is okay to start with. Social Clout is the app to use for tracking influencers and keywords on social media. It’s powerful in identifying who and what is important to your target audience. Follower Wonk is a really cool social media management app for Twitter. The guys from Moz know what they’re doing – the app helps you find what you need, analyze and optimize your social-media efforts. If Twitter is your social media network of choice, use Follower Wonk to get deeper information about your followers, where they are located, and when they tweet. 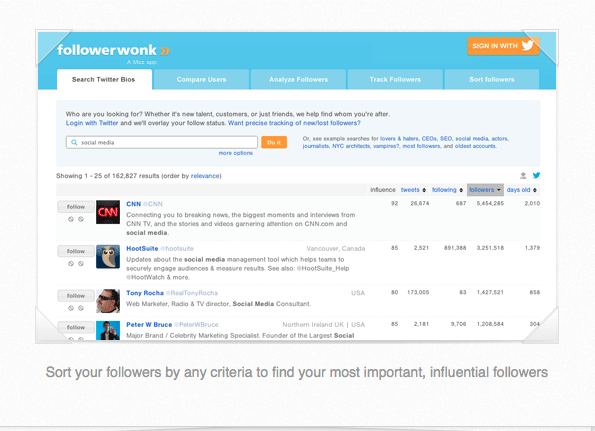 Follower Wonk is a niche social media management tool that does very few things, but very well. There are three plans, but you can start for free if you only want to manage one Twitter account. You’ll pay $29 for up to 3, and $79 for up to 10 which it’s quite handy if you’re a social media manager. 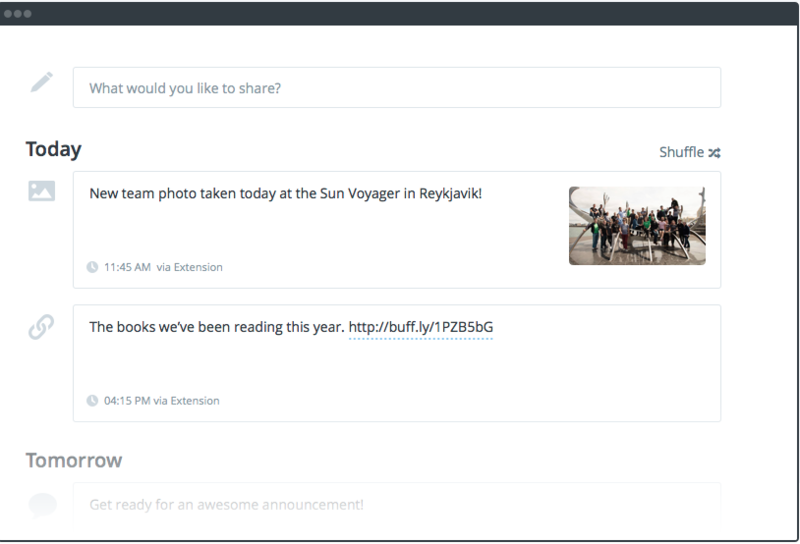 You probably use Feedly to follow what’s going on in the content world, but did you know it integrates with Buffer to help you curate and share content? No, right? Well, it does. And it does a fantastic job at that. If you go for Buffer, check out how Feedly can help you share the best viral content. Marketing automation anyone? Do I hear a big YES? Socedo is the social media lead generation automation tool that is used by the giants in the industry, yet it is affordable for small businesses. It’s free to try for enough time so that you can make up your mind. In the meantime, Socedo will bring in relevant social prospects into your sales pipeline. Neat, isn’t it? That’s another tool that transforms social media from something nice to have into something that creates sales for your business and clients. The platform matches user interests to your business for a win-win relationship. When I hear “sprout”, I get excited. 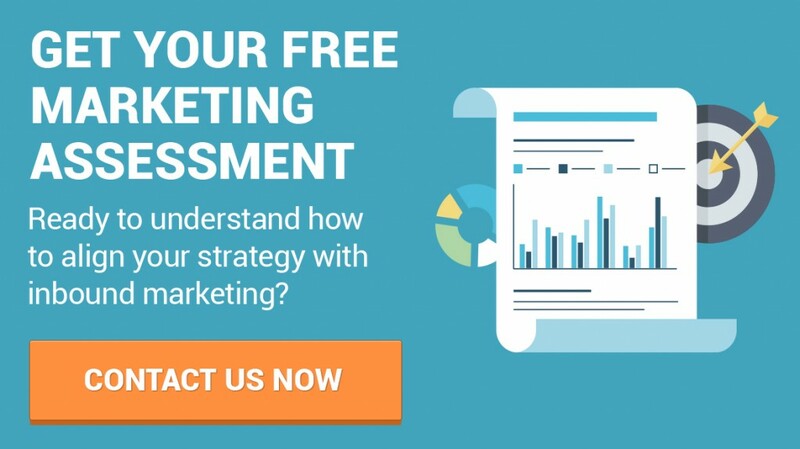 These guys know what really matters in inbound marketing, and they also know that quality doesn’t come for free. If you are on the same page, I highly recommend this social media management tool. It’s costly (starts at $59/month) only at first glance because it surprises with functionality that doesn’t end with scheduling your posts. SproutSocial comes in to make your life easier with a single stream inbox designed to help you never miss a message, and tools to seamlessly post, collaborate and schedule messages to Twitter, Facebook and LinkedIn. You get essential insights, monitor performance and keywords in one stream, get analytics and visualize important data. The best part is that it allows you to share your social messages on the go with a mobile app available on iOs and Android. 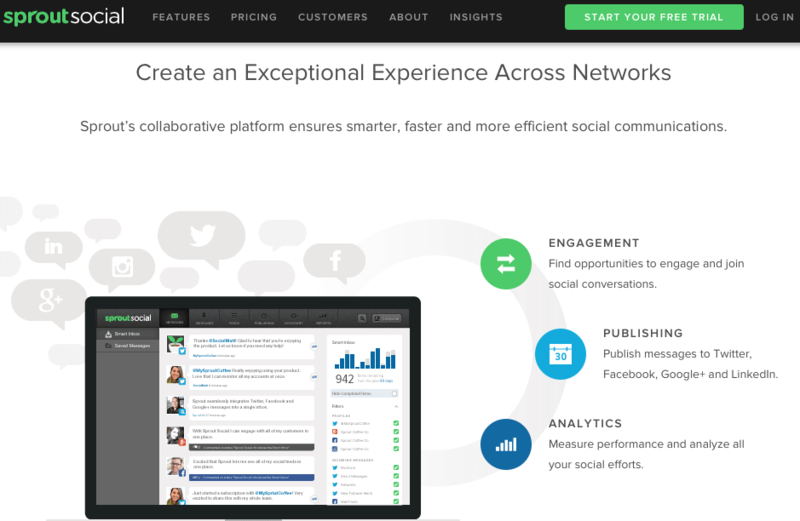 Within 24 hours of registering for Sprout Social it will tell you what you could be doing better. That’s already worth the first month’s fee. PostPlanner is a great solution if you aren’t sure where you’re going with social media yet. It’s affordable, with simple and easy to use capabilities that allow you to publish and queue posts on Facebook and Twitter. A noteworthy feature of PostPlanner is its “viral content” – you see what content has gone viral to use on your social media accounts. If your fans love an article from a popular blogger, why not share it? You can get it for as low as $5/month. 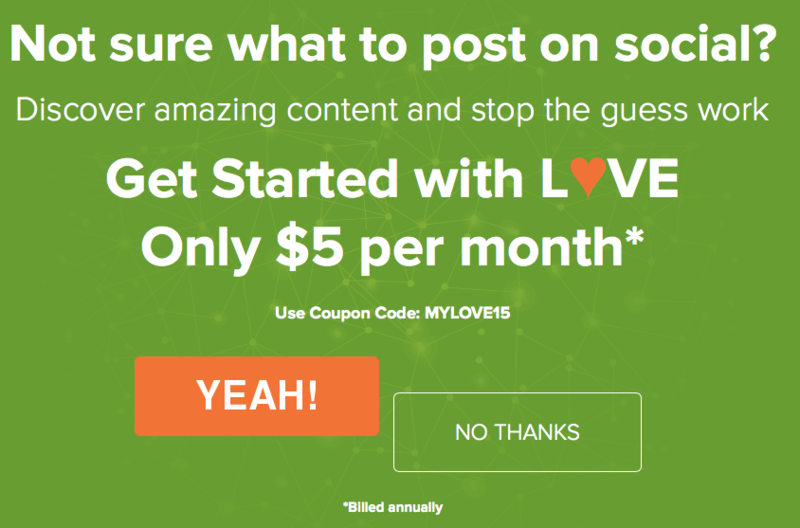 PostPlanner is for starting inbound marketers that don’t have a good idea about what their audience loves yet. It will do the job for you. 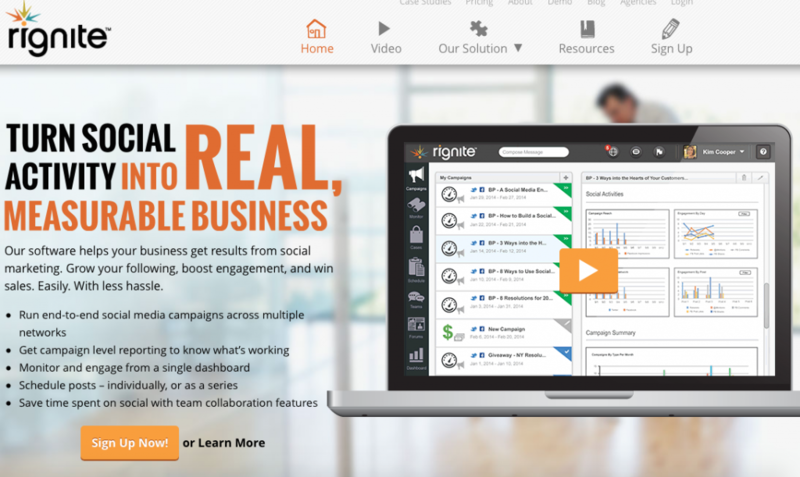 Rignite is an all-in-one social media management platform, covering daily posting, goal-based campaigns, and analytics data. Its unique feature is the campaign based posting that allows you to set a specific set of posts to go with a product launch, an event or a promotion and track the results of that campaign. Prices start at $28/month. Rignite is the tool you want to use if you’re result oriented and want to turn your social media accounts into revenue-producing activities. Social media for B2C and B2B isn’t the same thing, right? Oktopost is social media management platform for B2B marketers, focused on lead generation campaigns. That’s one of the few social media management software apps that understands the needs of B2B marketers for campaign-based social media presence. That’s reflected quite notably in their pricing. Oktopost is not for the casual marketer, neither it is for the solopreneur. If your client or organization needs powerful tool to reach businesses in a professional way, go for it. Last, but not least, let’s look at Sendible. We love it because it might just turn out to be the only social media tool that you’ll ever need. How about measuring the success of each and every piece of content you share and getting meaningful reports that tell you what to do? That’s Sendible. It’s even more powerful than you think – it goes beyond social media into CRM and helping you serve your customers and leads in the best possible way. 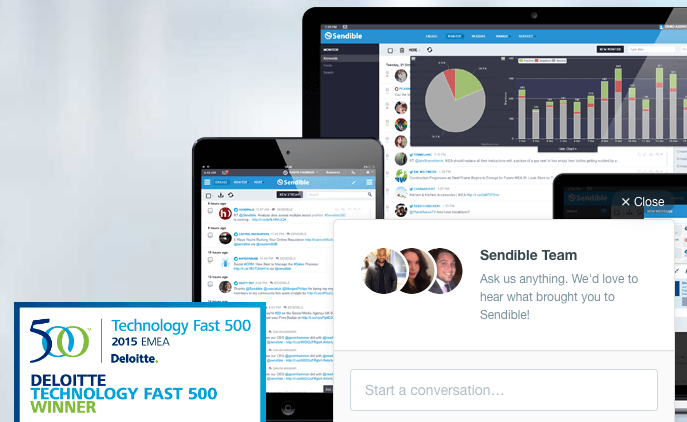 If you’re looking for fully integrated social media marketing solution, rather than a posts scheduling app, Sendible is what you need. Pricing starts at $59/month and goes up from there, but so does the magic that Sendible does for you. Social media management automation is key for efficiency. You can’t stay on top of things with the overwhelming flow of content, followers activity and conversations that are happening simultaneously. Some of the tools that we discussed will make your life easier and some will completely transform the way you do social media. It’s up to you what you want to go for. But when you’re ready, implement the most powerful social media automation that you can afford. If you still feel overwhelmed and aren’t sure where to start, we’re happy to help. Before closing this tab, stop and think – where are you going to start today to automate your social media presence? Are you going to sign up for an IFTTT account or begin a Sendible trial? Our best tip: first identify your most important social media goal, and then, check out the ONE tools for managing your social media accounts that best fits with the goal, right after this sentence ends.